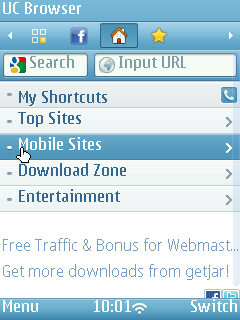 The latest UC Browser version 8.4 for Symbian S60 3rd. Edition and S60 5th Edition is now available for download at wap.ucweb.com (mobile) and www.ucweb.com (PC) The 5th Edition version also works on Symbian Anna and Belle. 1. UDisk – Cloud storage, integrated with the browser. Each file has an expiration date, from 7 days to infinity. Storaghe limits are relatively low; 70MB for long-time storage and 2GB for files stored up to 7 days storage. UC promises additional storage space will be available in the near future. 2. App Gallery – This is a new tab on the browser start page for quick access to UC’s built in “Apps” which are UDisk and The Quick Reads RSS reader introduced in version 8.2. According to the release notes a third app, Bookmark Sync is also part of the app center, however on my N8 and N95 it’s not there but is available from the bookmarks menu. According to UC more apps will be availbale soon. 3. Stable Release – Adopting a convention used by the Linux kernal, starting with UC Browser 8.4, even numbered versions like 8.4, 8.6, etc. are designated as stable versions while odd numbered versions like 8.5 or 8.7 will be experimental new feature releases. 4. Spanish Support – Hola! Qué tal todo el mundo? Starting with verssion 8.4 for Symbian and the yet to be released 8.4 for Java, the UC Browser will be available with a Spanish language UI. Support for additional languages is in the works as well. 5. New default theme – Version 8.4 introduces an arttractive new light blue and grey theme. A night mode theme is also preinstalled and over a dozen additional themes are available for download. I installed UC 8.4 on two Symbian devices, a Nokia N8 and a Nokia N95-3. Installation over the previous 8.2 version went through without a hitch on both phones and retained my bookmarks and settings from the earlier version. I’d experienced problems syncing bookmarks with UC version 8.2 on both phones. I’m pleased to report that with the N8, this version seems to have fixed the issue where bookmark sync would not recognize my password. On the N95-3, the browser would silently crash whenever I tried to sync my bookmarks in 8.2. Sadly, 8.4 doesn’t seem to have helped, the browser still shuts down with no error message when I try to sync bookmarks. Other than the bookmark sync issue with the N95-3, the browser worked well. All the sites I tried loaded without error except for Twitter. As has happened with previous versions of the UC browser, I got a 403 Forbidden (Rate Limited Exceeded) error trying to load mobile.twitter.com. This is obviously a Twitter issue, the same error used to appear with Opera Mini, but Opera worked with Twitter to quickly get it resolved. 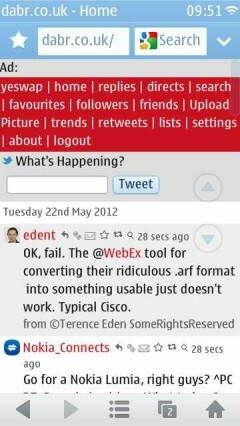 The third party Twitter client dabr.co.uk, which I prefer over the official Twitter web app, works flawlessly with UC Web. UDisk worked well. I had no problems uploading files as large as 1.2 MB. Cloud storage is a useful feature and having it version built into the browser is handy. However UCDisk is misssing two of the most useful features of other cloud storage services like Dropbox, sharing and access from any browser. There doesn’t seem to be any way to share a UDisk file with other users or to access UDisk with any browser except the UC Browser, making it impossible to use UDisk to transfer files between PC and phone. Hopefully sharing and general web access for UDisk are in the works. UC 8.4 for Symbian is a recommended upgrade for all Symbian users. UDisk seems handy if limited, and the bookmark sync issue is fixed, at least on some devices. This entry was posted in Browsers and tagged Symbian, UC Browser by Dennis Bournique. Bookmark the permalink. Is there a particular URL or action that makes it crash? I haven’t noticed any issues with UC Browser 8.4 on my Nokia N8 with Belle. I found this option with my ucweb at nokia 5800xm but i was confused. 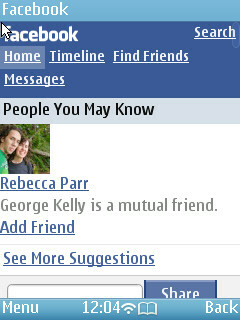 Thanks for info. “…download at wap.ucweb.com (mobile) and http://www.ucweb.com (PC). Isn’t there a provision to simply play the file stored in UC Disk without downloading it to the device? Looks far fetched,but if incorporated,it’ll take mobile browsing to an entirely new level. I am using UC browser 8.3. 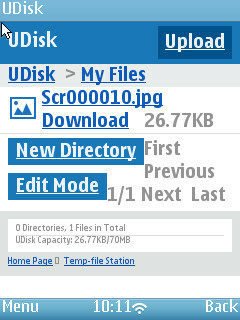 It also has UDisk option. But once you login, you don’t have option to logout. Is there anyway to logout? 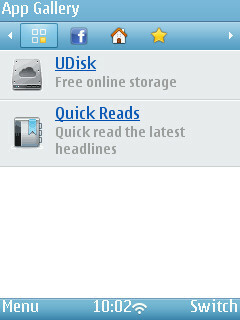 But the new UC browser is good, as the UDisk option is very useful. I have uploaded a 8.9mb file and downloaded it again with no problem. There’s currently no way to log out from UDisk.